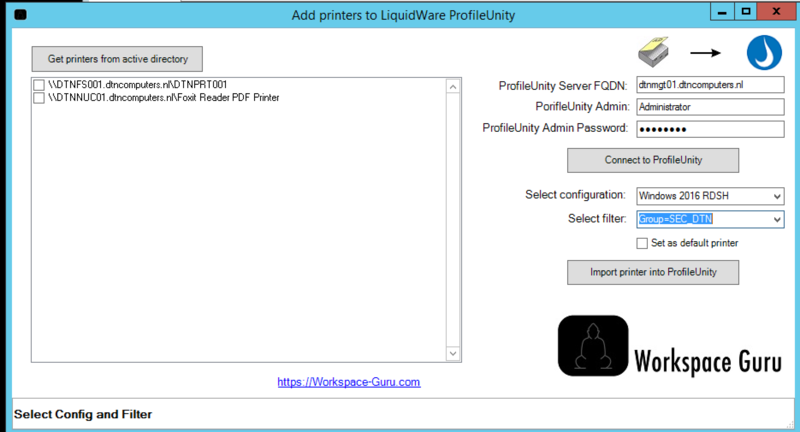 Liquidware ProfileUnity lets you manage which printers users get in their session. This is really handy because users don’t have to find and add printers on the network themselves. And with context aware filters you can make sure they get the correct printer for every situation. 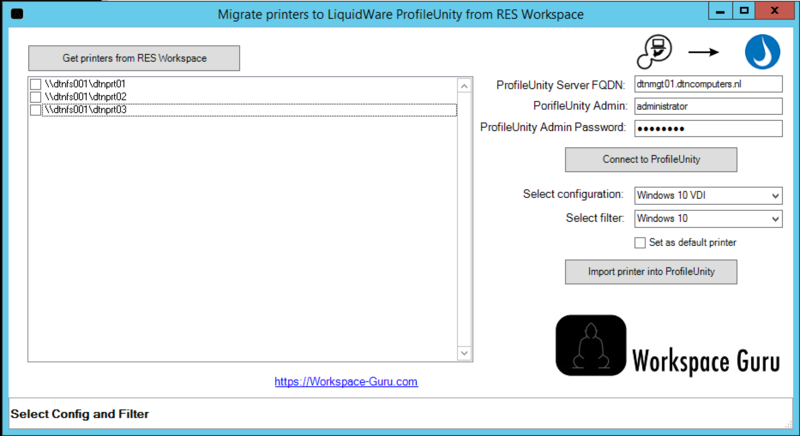 But what if you have a lot of printers in your active directory or RES Workspace already and you’re switching to managing them with ProfileUnity (especially now the UEM market is changing). Well, you could add them by hand or you could use one of the two small tools I created. This tool allows you to scan your Active Directory for shared printers and add them directly into a ProfileUnity configuration with the correct filter. When you start the tool it will check if you have the Active Directory PowerShell module installed. If not you will get a warning. Then you click on ‘Get printers from active directory’. This will show you all the printers in your active directory. Now you need to fill in your ProfileUnity Server and credentials and click on Connect to ProfileUnity. This will get the filters and configuration from your ProfileUnity server. After that select the correct printers, configuration and filters and click Import printer into ProfileUnity. And thats it! Now all the printer are in ProfileUnity. This tool works like the other tool except for the printer selection part. This will not get the printers from the active directory. But this will get the printer from RES ONE Workspace. This does require to run the tool on a machine with the RES ONE Workspace Console installed. can you tell me if this tool is working with the new Profile Unity version 6.8. I”ve tried and everything seems to work but the printers are not added. I checked your log and there is an error with loading the printer configuration. So I think 6.8 broke the json connection. My lab is 6.7 I will upgrade and get back to you in a couple of days.